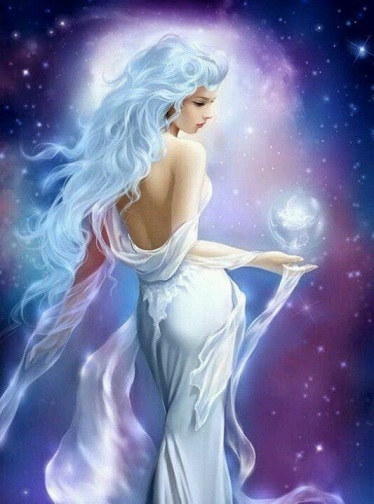 In Greek mythology, Leucothea (Leukothea )(Greek the "White Goddess") was one of the aspects under which an ancient sea goddess was recognized. Mythic themes agree that she was a transformed nymph. In the more familiar variant, Ino, the sister of Semele and queen of Athamas became a goddess after Hera drove her insane as a punishment for caring for the new-born Dionysus. Ino/Leucothea leapt into the sea, with her son Melicertes in her arms. Out of pity, the Hellenes asserted, the Olympian gods turned them both into sea-gods, transforming Melicertes into Palaemon, the patron of the Isthmian games that were held in his honour. In Rhodes, a much earlier mythic level can be detected. There, the woman who plunged into the sea and became Leucothea was Halia ("of the sea"), a local nymph and one of the aboriginal Telchines of the island, who succumbed to Poseidon, nurtured on the island. In the Odyssey Leucothea makes a dramatic appearance as a sea-mew who offers the shipwrecked Odysseus a veil to wind round himself to save his life in the sea. Homer makes her the transfiguration of Ino. Leucothea is The White Goddess of Robert Graves. The Etruscan Losna may well be comparable. There was also a mortal woman in Greek mythology named Leucothoe: a mortal princess, daughter of Orchamus and sister of Clytia, Leucothoe loved Apollo, who disguised himself as Leucothea's mother to gain entrance to her chambers. Clytia, jealous of her sister because she wanted Apollo for herself, told Orchamus the truth, betraying her sister's trust and confidence in her. Enraged, Orchamus ordered Leucothoe buried alive. Apollo refused to forgive Clytia for betraying his beloved, and a grievous Clytia wilted and slowly died. Apollo changed her into an incense plant, either heliotrope or sunflower, which follows the sun every day.